Greetings everyone, and welcome to my universe. 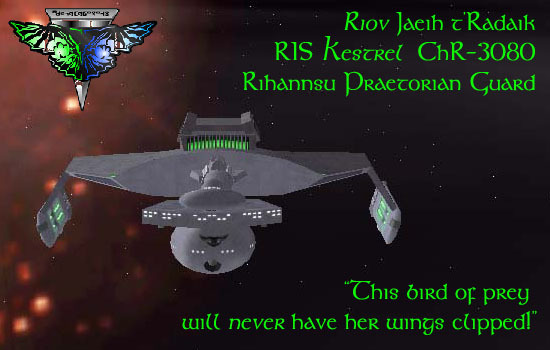 In my universe, the Romulans call themselves "Rihannsu" the same way Terrans are also called "Humans". We are more than pseudo-Roman wannabes with massive superiority complexes, and I plan to bring this home to you through my stories, which will hopefully be very good reads to boot. Within the pages of these stories, you will find adventure, excitement, love, friendship, loyalty, and betrayal  and that's just in 'Kestrel'. All the stories I will present to you here will be slightly modified from their original form as posted on the Taldren Fan Fiction Forums, where all my friends "hang out", as they say on Earth. I will be altering them to remain internally consistent and in keeping with my changing perceptions of the "rules" of Star Trek, rather than just leaving them as is and according to my old perceptions. Hopefully, this means my stories will improve with time, not to mention seeming more mature and less amateurish as my (also hopefully) increasing writing and story-telling skills will come into play to edit the older works for higher plausibility and consistent technology applications. This latter is directly opposite to the pattern as established on-screen, in which new technology and terminology is retrofitted into past series. But without further ado, here are my stories. Finally putting the scenes in my head to the music that inspires them. In the years before the Romulan Star Empire and United Federation of Planets renew their acquaintance, newly promoted Commander Jaeih t`Radaik transfers to the Klingon/Romulan border region  and comes under fire from superior forces while alone. A Federation survey mission into a desired star system leads to a vicious three-way confrontation. Captain Meltakh, disgraced by losing his battlecruiser to a Federation destroyer in The 'Jugurtha Betrayal', must serve as the captain of a J-variant  a Klingon penal ship  in order to redeem himself. A Federation starship violates the Neutral Zone and gets a warm reception from the Romulan defenders. Commander t`Radaik gets a new ship, but a distress call from a colony ship leads to strife on board from an untried crew. Commander t`Radaik teams up with Commander T`Cel to investigate the 'Bug-Uglies', but their search leads them into Federation space. On her first posting after graduating from Starfleet Academy, Lieutenant Andrea Brown gets a hard lesson in the politics of command. An embittered Klingon warrior exacts his vengeance on an isolated Romulan outpost. A chance encounter between two familiar faces shows us just how entertaining a layover can be. The death of a close friend on the orders of an unscrupulous politician puts Commander-General t`Radaik on a quest for vengeance. A time-displaced captain and her loyal crew along with her sturdy ship must brave the trials of the greatest onslaught the Federation has ever known in its 200+ year history. A captain under orders from the nefarious Section 31 investigates a missing ship on the border with the Magna Romans, but the Romans don't take kindly to the Federation intruder.